It would have served me nicely to actually walk the streets of Paris for this outfit, but if you can't go, Carven might bring them to you! 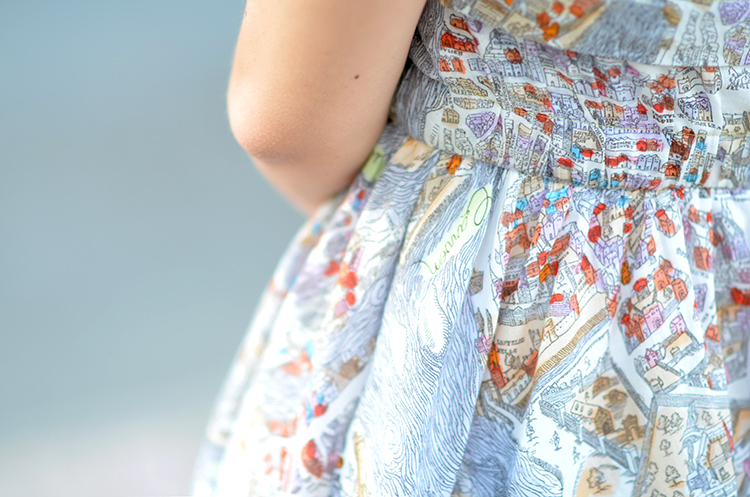 Initially I thought the SS13 RTW safari prints from the catwalk went a long way towards transporting us across borders, but when I came across this dress I decided wearing the Seine trumped giraffes and caravans. I love the french feel of the wide scoop neck and gathered waistline, but mostly I like the fact that you only notice the print when you look really closely, which is also when you realise the extent of the detail. Of course I have no way of knowing how accurate this map is, but all the same! Lovely! Very ladylike and classic, but with a modern twist. The dress is absolutely stunning and ladylike. You look elegant my dear. That is such a pretty ensemble! Love how you put the outfit together, and the dress is gorgeous! what a nice dress, it's very proper right? and love the way you did your hair!! I looooove the dress!!! I´ll be moving to France in the fall and that dress would be perfect! Beautyfull clutch!!! And your hair looks amazing!! Loveit!! Such a lovely put together look! Love how you did your hair! Thanks for the follow girl!